BEFORE APPLYING :Make sure your hands are clean and dry before handling the image. If cake is frozen, thaw slightly before applying the icing. Edible Images need moisture to blend into a product. If your product is dry, spray a SLIGHT mist of water, brush on simple syrup, or add a small amount of icing to your product (NOT the image) before applying image so it will adhere to your product. If your product is moist, DO NOT add any extra moisture. Using too much water may cause colours to run. If using circle cake top DO NOT cut around cake top before removing backing. If using ribbon, cut into strips before removing backings . OPTION 1- ONLY USE THIS OPTION IF YOU HAVE A DRY FROST FREE FREEZER REMOVE PACKAGING. PLACE SHEET FLAT ON PIZZA BOX AND CLOSE DOOR. WAIT UP TO 1 MINUTES (IN WARMER TIMES OF YEAR IT CAN TAKE A LITTLE LONGER OR IF YOUR FREEZER IS VERY FULL) THE ICING SHEET WILL FREEZE AND GO HARD AND YOU CAN JUST PEEL AWAY THE BACKING SHEET AS PER VIDEO.PLACE STRAIGHT ON PREPARED CAKE. OPTION 2 - REMOVE PACKAGING. HOLDING TOP AND BOTTOM OF ICING SHEET RUB THE BACK OF THE BACKING VIGOROUSLY(AS PER PICTURE AT TOP OF PAGE) UP AND DOWN ON A KITCHEN/CUPBOARD SHARP WORK SURFACE TO SLOWLY PEEL AWAY THE ICING SHEET. TAKE YOUR TIME AND WORK YOUR WAY AROUND THE CIRCLE/A4. MOVING THE PAGE AROUND AS EDGES COME AWAY. THE TOPPER SHOULD PEEL OFF EASILY DO NOT FORCE IT, HOWEVER DONT BE AFRAID TO RUB HARSHLY. PLEASE WATCH OUR YOU TUBE VIDEO TO ALSO GET APPLICATION TIPS AND TECHNIQUES. Once the cake top is placed on the cake gently smooth it down and leave to set in place. Decorate edges as you wish. DO NOT WRAP CAKE TIGHT WITH FOIL OR CLING FILM AS ICING SHEETS CAN GET STUCK TO IT WHEN LEFT OVERNIGHT. EITHER PLACE IN CAKE BOX OR WRAP LOOSELY. DO NOT APPLY BAKING PARCHMENT OVER TOP AS THIS WILL STICK. I love the hot weather but my icing sheets dont!!! The humidity and temperature can cause them to stick a little. If you struggle to remove from the backing using option 1 and option 2 from instructions and video we recommend using below method. The problem has occured as moisture will have got into the icing sheet probably from the atmosphere. 1. Turn your oven onto a temp of around 150 and let it get up to temperature. 3. With your oven still warm inside (but not hot) put the icing sheet(out of the pack) in the oven and close door and leave for around 40 seconds. 5.On hardening follow option 2 by holding top and bottom of backing sheet and rubbing backing off a sharp counter top and icing sheet will peel away. 6. Apply to cake We have found this to be a failsafe method when icing sheet has gotten warm and floppy. OUR PRE CUT ICED CUPCAKE TOPPERS ARE EASY PEEL. THIS MEANS YOU SIMPLY PEEL LIKE A STICKER FROM THE PLASTIC BACKING SHEET AND PLACE ON CAKE OR TOPPING. DO NOT LEAVE THEM OUT OF THE BAG AS HUMIDITY WILL CAUSE THEM TO STICK TO BACKING SHEET. SHOULD YOU HAVE ANY PROBLEMS HOLD TOP AND BOTTOM OF BACKING SHEET AND RUB BACKING SHEET VIGIROUSLY AGAINST A SHARP DESK EDGE SO CIRCLES PEEL AWAY FROM BACKING. We would recommend if weather is warm or humid to either place on a flat swirl of buttercream or use a fondant disc under them to support them. This can be very easily made cutting a circle out of flat fondant icing waiting for it to dry out (couple of hours) then VERY lightly brush with water and place icing topper on top. 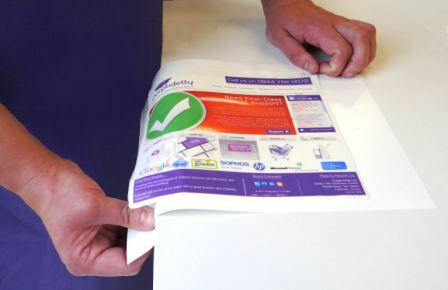 Cut the images from the designed sheet as required using clean dry scissors. Place on top of finished cupcakes or cake using buttercream, white edible gel, melted chocolate or icing pen . REMEMBER ALL IS EDIBLE!!!!!! YUM ENJOY!! !